Glomerulonephritis is a type of kidney disease in which the part of your kidneys that helps filter waste and fluids from the blood is damaged. Glomerulonephritis may be caused by problems with the body’s immune system. 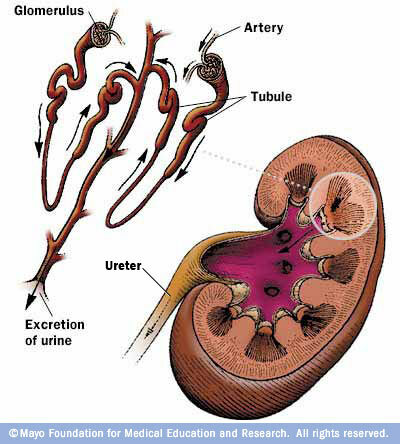 Often, the exact cause of glomerulonephritis is unknown. Damage to the glomeruli causes blood and protein to be lost in the urine. The condition may develop quickly and kidney function is lost within weeks or months (called rapidly progressive glomerulonephritis). A quarter of people with chronic glomerulonephritis have no history of kidney disease. Diagnosing the pattern of glomerulonephritis is important because the outcome and treatment differs in different types. Primary causes are ones which are intrinsic to the kidney, whilst secondary causes are associated with certain infections (bacterial, viral or parasitic pathogens), drugs, systemic disorders (SLE, vasculitis) or diabetes. The proper diagnosis and ultimately care of a patient with glomerulonephritis begins with having an outstanding kidney pathologist, to interpret the kidney biopsy, that works closely with the nephrologist. University of Florida is fortunate to have world-class kidney pathologists who go over the kidney biopsy side-by-side with the nephrologist. With the proper diagnosis in hand we can develop the optimal treatment plan for the patient. We are experienced at working with other disciplines, as necessary, such as Pulmonary, Rheumatology, and Hepatology to develop the optimal treatment for the patient. The patient can also be comforted that most complicated cases are presented to the whole division to utilize group expertise to come up with the best possible treatment.